This new, fully colored edition brings the historical action within the pages of AGE OF BRONZE to new, greater levels. Daring heroes, breathtaking women, betrayals, love and death--the most spectacular war story ever told: The Trojan War. When a lustful Trojan prince abducts the beautiful Queen Helen of Sparta, Helen's husband vows to recover her no matter the cost. So begins the Trojan War. From far and wide the ancient kings of Greece bring their ships to join the massive force to pledge their allegiance to High King Agamemnon. Featuring the greatest of the Greek heroes: Achilles, Odysseus, and Herakles, along with a cast of thousands. 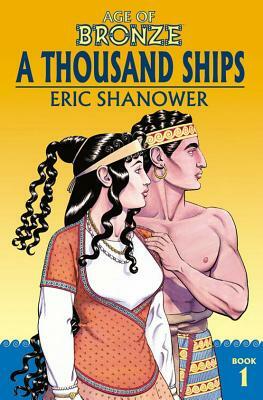 AGE OF BRONZE: A THOUSAND SHIPS reveals hidden secrets of the characters pasts, serving up joy and sorrow, leading up to the brink of war, and foreshadowing the terror to come. Age of Bronze will be included in a major international exhibition travelling to three German museums in 2002. The exhibit is centered on the current excavations at Troy and features Age of Bronze in an exhibit devoted to modern interpretations of Troy. Age of Bronze has been nominated for numerous Eisner (The comic industry's Oscar) Awards. Rack it in your mythology and historical fiction sections for even more sales success.